One of the first, if not the first, Japanese World Map to incorporate western style Comparative Mountains and Rivers charts. Kaisei shinpan bankoku meisai zenzu. /萬國明細全圖, 改正新版 / Clear Detailed Full Map of the Ten Thousand Kingdoms. 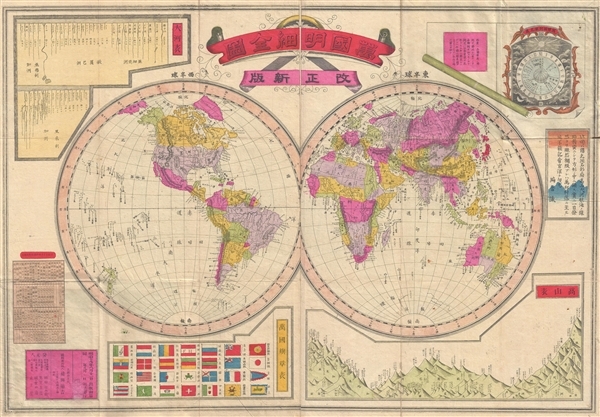 A scarce Japanese map of the world issued in Meiji 19 or 1886. This map is significant for its incorporation of western scientific data into a Japanese map. Most importantly, this is one of the first, if not the first, example of European style comparative world mountains and rivers charts to appear as such on a Japanese world map – significant cartographic development given that similar world maps incorporating mountains and rivers chart only started appearing in American and European publications about three years earlier. The map covers the entire world on a double hemisphere projection. Some geographical features, such as Great Salt Lakes, are wildly exaggerated, but on a whole the map exhibits considerable accuracy. In the lower right there is a comparative chart illustrating the heights of world mountains with divisions by continent. In the upper left is a comparative rivers chart. In the upper right a beautifully engrave chart expresses time zones. A flag chart appears in the lower left. This map was published by Torakichi Maeda (虎吉前田). This map is rare with only one other known example held in the East Asian Library at UC Berkeley. Torakichi Maeda (虎吉前田, fl. c. 1880 – 1890) was a Japanese author and publisher active in Osaka during the latter part of the 19th century. Very good. Minor wear on original fold lines. Folds into original binder.